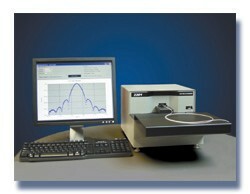 The 2201 Far Field Scanner provides high speed, high dynamic range measurement of the mode field diameter and effective area of single-mode fibers and the numerical aperture of multimode fibers using direct far field scanning, the ITU reference technique. The 2201's measurement performance and flexibility is unrivaled. With a scanning numerical aperture over 0.85 and measurement wavelength ranges of either 500 to 1000 nm, or 900 to 1700 nm, it can be configured to characterize the mode field diameter and effective area of virtually any single-mode optical fiber available today. Up to four internal, high power laser or LED sources can be quickly connected to the fiber under test with low optical loss via a Photon Kinetics 1100, or 1120 Bare Fiber Aligner, or similar customer-supplied coupling device. The 2201 combines "standards laboratory" measurement precision with the ease-of-use and measurement speed that are essential for the production floor.